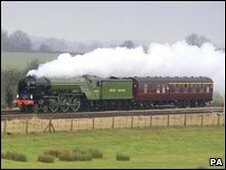 The first new mainline steam engine to be built in Britain for nearly 50 years has made its maiden voyage carrying fare-paying passengers. Hundreds of people gathered at Newcastle Central station to watch as the Tornado pulled in on Saturday. Enthusiasts in Darlington raised £3m to build the Peppercorn class A1 Pacific locomotive, which has taken 18 years. It travelled from York, calling at Darlington and Durham before stopping in Newcastle before its return trip. The engine has been undergoing trials while at its new home at the National Railway Museum in York. Seats on the first journey have been reserved for supporters of the A1 Steam Locomotive Trust, which built the engine, as have those on a second outing on 1 February. Other people will be able to buy tickets for Tornado's first trip to London's Kings Cross on the East Coast Main Line on 7 February. Mark Allatt, chairman of The A1 Steam Locomotive Trust, said: "One of the things this project has done is bring interest in railway and steam locomotives back into the mainstream. "It's not just a bunch of anoraks interested in steam, it is a huge number of people across all aspects of society. "We've got something in these recessionary times that people can smile and feel good about."